Pediatric Dental Care owned by Dr. Corina Ramirez is a pediatric dentist office in San Dimas, California. The office has great interior decor that puts her patients in a fun environment. It’s hard to get a kid excited to go to the dentist, but by making the office a visually pleasing place, the kids can be excited to visit their dentist. The whole office has a blue and white nature theme so they wanted a large lobby sign to display their logo using the same theme. One of the lobby walls is made from white tile. A few blue paper butterflies are attached to the wall, but the rest of the wall was blank so it was the perfect place for the new lobby sign. We digitally printed their logo onto vinyl and attached it to a white acrylic baker that was contour cut to the shape of the logo. 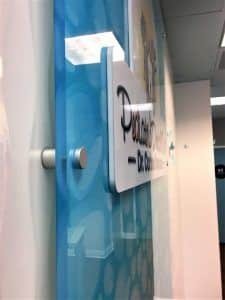 Instead of just installing the acrylic backer with the logo directly onto the wall, they wanted to add a second layer of acrylic to add more dimension, color, and visual appeal. We created another acrylic backer that was almost the length of the wall. For this backer, we used clear acrylic instead of white acrylic. 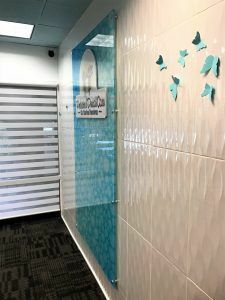 A water drop pattern that was provided to us by the customer was digitally printed onto clear vinyl and backed with white vinyl to make sure the colors of the print could still be seen but it wasn’t a solid image. The print was attached to the back of the large clear panel and we attached the logo panel to the front. We stud mounted the backer with spacers so the sign would be floating off of the wall. Spacers were optimal due to the weight of the sign, and also because the wall is not completely flat. 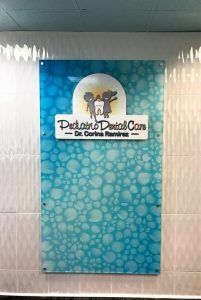 Incorporating digital prints into your lobby sign is a great way to customize it and to make sure all of the colors of your logo are included along with any additional pattern or texture you want. We have made many lobby signs with acrylic backers that have digital prints on them. Whether the logo is digitally printed, or the whole thing is digitally printed, the colors will match your logo exactly and look great displayed in your lobby area. Feel free to check out our website gallery for other lobby signs we’ve made that have digital prints on them. If you want to contact us to get a sign project started, you can request a quote here.